Desco Red White Scarf, Made In Japan. Shipped with USPS First Class Package. Mfg miss dye at corner of scarf. 25% nylon, 75% Bemberg. Made in Japan. Narrow hem. Large paisley design. Red is a deep rose red. Scarf City Ahead - S hop Jacque O's Closet -. Color:Deep Rose Red, grays, off white, black, etc. There are no holes, torn areas or wear. Great colors and design with polka dots and square dots. 21" square. Most of my scarves have been in storage, so may need light wash. The scarf's motif is set on a cream background with black border and double CC marking on each corner inside a square sort of box. Hand Rolled Hem. PROFESSIONAL Dry Clean ONLY. Gorgeous rose floral design. 100% silk made in Italy. 32" square. It is in very good condition. Recycling is good for everyone! All communication must go through e-bay. 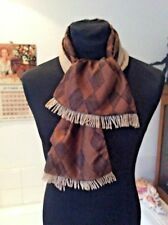 Scarf by Beckford Silk England. pretty pretty Spring scarf! Long 60" by 20". Green & blue polka dots. Designed by: Vera Neumann. About Vera Neumann. Before Vera Wang…before Vera Bradley … there was just Vera. Vera was everywhere and everyone recognized her distinctive cursive signature with a little ladybug. Egyptian Hieroglyphics around the outside edges. Genuine mink fur. Versatile piece - wear it as a scarf or head piece, or attach to your coat as a collar. 27.5" long on top curve, 21" long on bottom curve. At ends: 5" wide including satin edge, 4" wide fur only. 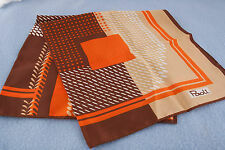 Lush red-orange square scarf with tiny flower print bordered in colored stripes. Scarves by Vera. Sheer light aqua colored scarf with gold leaves. 83% Vinal & 17% Silk. Made in France ~ 100% Acetate. It's about 52" by 12". Naturally raw edges. Jacquard weave pattern: None. Silk - Twill. Product code: SV/1/15B. Weight: Heavy. Machine turned edges. Size : approx: 30" Square. Fabric : Polyester. DATE~ Orignal 1960s. COLOUR ~ Red art deco print. ITEM~ Scarf. FABRIC ~ Silky polyester.